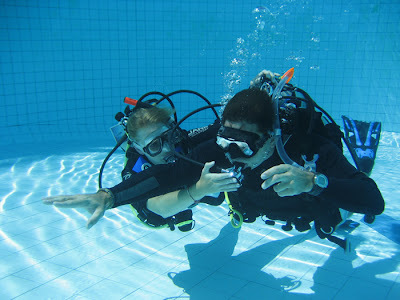 PADI, diving and Instructor Development (IDC) around Thailand: The September OWSI part of the IDC is on it's way. The September OWSI part of the IDC is on it's way. Today was already day 2 of the OWSI program, part of my current IDC. Jeff and Nienke are doing fine and Amit is looking on in the background, picking up more evaluation skills during his IDCS course. Here's Nienke in action during her first prescriptive teaching presentation in the classroom. She's showing us a lift bag. Here's Nienke in action during her Confined Water presentation earlier today, controlling Jeff whilst he is performing a Controlled Emergency Swimming Ascent (CESA), a skill from the Open Water diver course. Now it's Jeff's turn to control Nienke during his Confined Water teaching presentation, where he was in charge of the Cramp removal skill of the Rescue diver course. Tomorrow they're already on their last Knowledge Development- and Confined Water presentations. 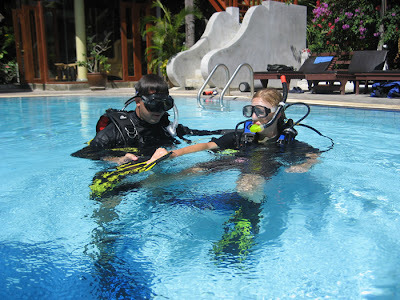 On Tuesday, 18th September, we're already on our way over to Koh Tao, to start the PADI Instructor Exam (IE). Stay tuned for more information about the current IDC and upcoming IE.